Who remembers the movie "Demolition Man"? Don't all raise your hands at once! For those who don't have any memory of the early 1990s sci-fi movie, here is all you need to know for the purposes of this column: Electric cars rule in the year 2032. The only people with cars that have combustion engines are the so-called "Scraps," a group of rat-eating freedom fighters who live underneath the city. Is that goofy movie an indication of the way we are heading? Many experts believe that the combustion engine will rule the streets until at least 2020. The pangs of loss can already be felt by those who are sensitive to the growing sentiment against big, powerful, gas-sucking beasts. Don't get me wrong, being good to Mother Earth is important. But what will we do without cars that blow our hair back and bury us in our seats when we hit the accelerator? Where will we turn to get the same thrill provided by models such the Audi R8, Corvette Corvette and Infiniti FX50S -- vehicles that just ooze power and spark a primal need for speed the second the engine fires up? Will future electric cars do that? And if so, how much will they cost? Right now the only car that comes close to providing the same thrill as the previously mentioned models is the Tesla Roadster, which starts at 89,000 euros in Europe (it's $101,500 in the United States). The cost is comparable to the FX50S, which starts at 80,000 euros in Germany. But for that kind of cash one can get a ski team in the FX50S and take it up a mountain. You couldn't do either with the Telsa. No, it's not fair to compare the two cars even though their price tags are similar. The point I'm trying to make is that I hope that the premonition from "Demolition Man" does not come true because a future without at least a few V-8s would force me to get used to the taste of rat. 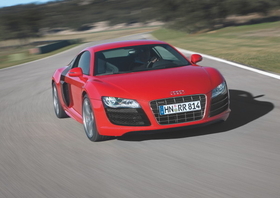 The Audi R8 oozes power and sparks a primal need for speed the second the engine starts.